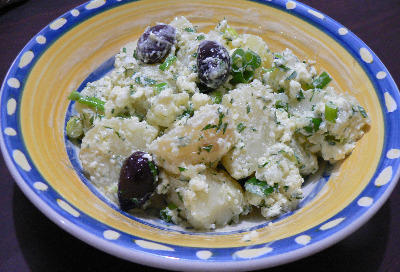 This recipe is the Greek version of the classic potato salad recipe. This Greek potato and feta salad is an easy dish to make, and is best served as an accompaniment to a main meal, or as a light lunch or supper. The warm potatoes accentuate the flavour of the lemon and herbs. Mixed with a Greek dressing, this salad makes such an appetising dish. This wonderful lemony herb potato dish smells and tastes delicious. As with many Greek meals, this is best left to sit awhile for the flavours to infuse and then serve at room temperature. Leaving the potatoes whole, in their skins, cook in boiling salted water for 25-30 minutes or until tender. Don’t cook them too long to become mushy and start to disintegrate. When cool enough to handle, pull the skins off with your fingers. Cut the peeled potatoes into quarters or cubes if the potatoes are large. Crumble the feta cheese over the potatoes. Add the spring onions, capers, olives, fresh herbs, freshly ground salt and black pepper. Toss gently, just enough to mix, being careful not to break the potatoes. Place the extra virgin olive oil and lemon juice in a small bowl and whisk together thoroughly for a couple of minutes until the dressing thickens and emulsifies. It if doesn’t thicken, you may need to add more olive oil. Whisk in the mustard, yogurt and season to taste with salt and pepper. 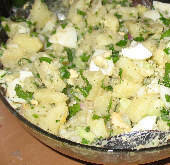 Pour the dressing over the potato salad and toss gently until the salad is mixed and coated with the dressing. 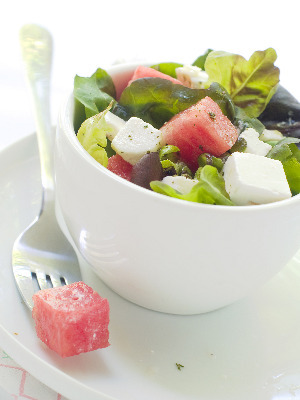 If you have time, the flavours will be enhanced if you leave the salad at room temperature for 1 hour before serving.